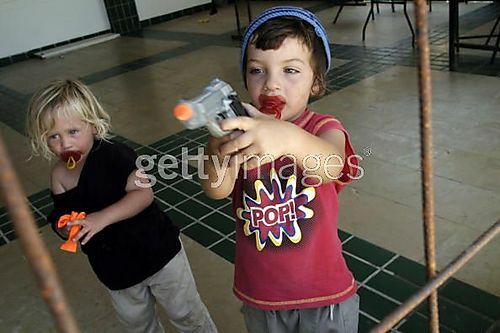 GUSH KATIF, GAZA STRIP - JUNE 30: Children play with toy guns in the Palm Beach hotel before it is evacuated by the police and IDF on June 30, 2005 in the Gush Katif settlement in the southern Gaza Strip. Israeli Border Police retook the former Palm Beach Hotel in the Muassi, the Palestinian area of the settlement, that had been occupied by right-wing Jews over the past several weeks. It was an attempt to thwart Israeli PM Sharon's disengagement plan, due to go into effect in mid-August and consequently Israel has declared the Gush Katif settlement area a closed zone to non-Gush Katif residents.